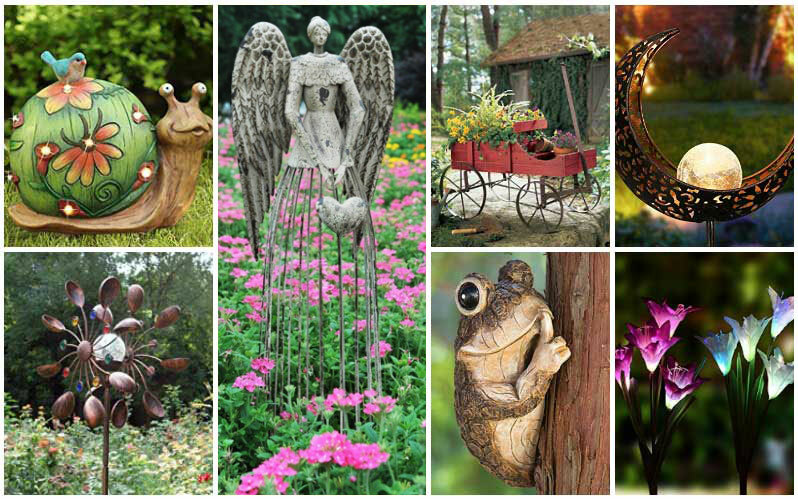 If you’re at all familiar with our site, you know that we simply adore unique and playful garden decorations. Whether big or small, bold or subtle, decorating your garden is akin to accessorizing with jewelry. Just like jewelry, it may not be necessary, but it’s incredibly fun and can completely enhance appearances. When choosing to accessorize your garden and yard, you’ll first want to think about just what types of items you’ll want to see out there. Do you enjoy a relatively cohesive garden, with nature-themed decorations? Do you want items that will stand out a bit more? Color, shape, and size are all important considerations. If you’re looking for a large, standout piece to really tie the garden together or stand apart from it, you’ll want to purchase something that you truly love and wouldn’t mind seeing daily. 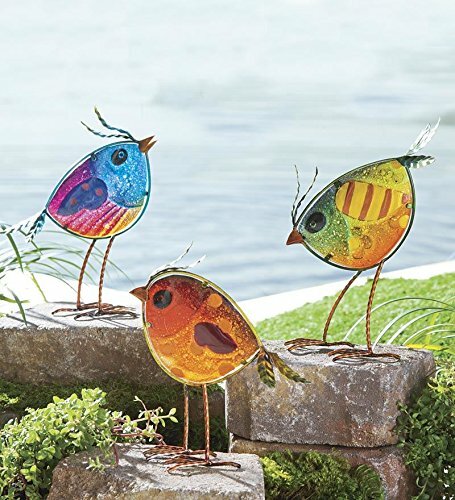 Instead, maybe you’d like a set of smaller pieces that can be laid out throughout the yard or garden, populating it with bursts of whimsy. The options are virtually endless, of course. From completely DIY projects to beautifully crafted retail pieces like we’ve gathered below, there are an untold number of ways you can spice up your garden with some attention-grabbing fun. If you are looking for a fun figurine to place in your garden, then this cute orange striped cat is perfect. It is playing with four little garden gnomes. 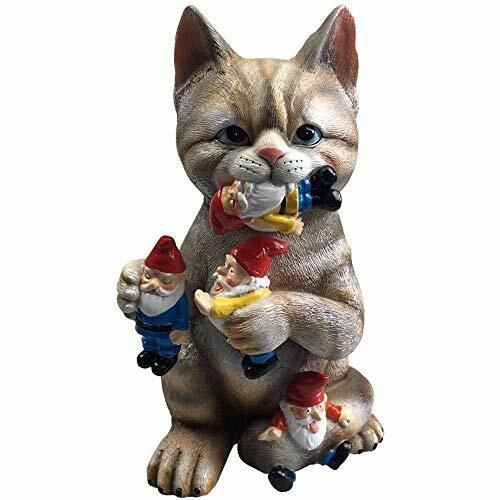 In fact, the cat even has a gnome in its mouth, but the guilty look in the cat’s eyes show that it knows that it is supposed to play nice in the garden. This statue is also small enough to fit on a table or a raised area in the garden. This snail is a charming decorative option that you can place in a grassy area. The shell is decorated with flowers, and the center of each one has a light that is solar powered. There is also a small blue bird on the snail’s shell, which adds to the figurine. Since this snail is designed for a garden, the beautifully hand-painted coat is also waterproof and sun proof to help prevent fading over time. This intricate angel is made from poly-resin so that it is easier to carve and paint, especially when you consider all of the details on the feathers and the hair. The angel is kneeling down on a rock, holding a dove in her hand. 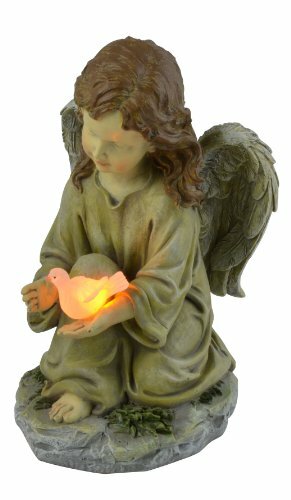 The dove is glowing with solar-powered LED lights that are positioned inside of the bird. With a full charge, this dove can illuminate your garden for up to eight hours. If you love turtles, you will love this cute, solar-powered garden display. 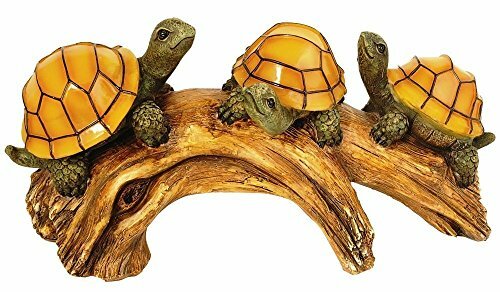 There are three turtles, each with extreme detail, sitting on a curved log. This log looks like it belongs next to the water, so if you have a pond, consider positioning it nearby. In addition, the turtle’s shells glow at night, and with a full charge, they can last a full eight hours. This is one of our favorite items on the list, an absolute rush of color and light that we think would look delightful in any outdoor setting. The multicolored glass has an appeal all its own, only improving with its setting inside an abstract bird sculpture. Set a few of these in the grass on the edges of your garden, plant them amongst the vegetables, or set them up on fence posts for an evocative look. 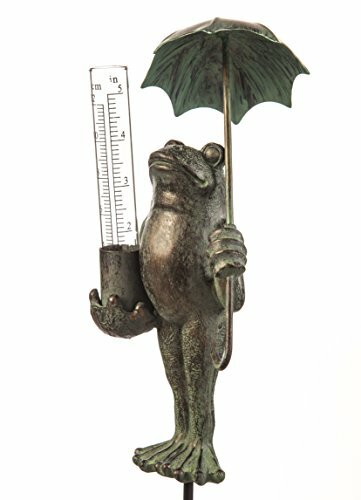 On the more subtle end of the garden decoration spectrum is this single color rain gauge frog sculpture. The anthropomorphized little guy is relaxing in the rain holding up a rain gauge, shaded by a tiny umbrella. Great for your garden or a cute gift! Lilies are beautiful flowers, but in most gardens, you can only see them during the day. If you place these Lily stakes into the ground near your plants, you will illuminate the area so that they are more visible at night. These lilies come in purple and white, but they can be changed to seven different colors. 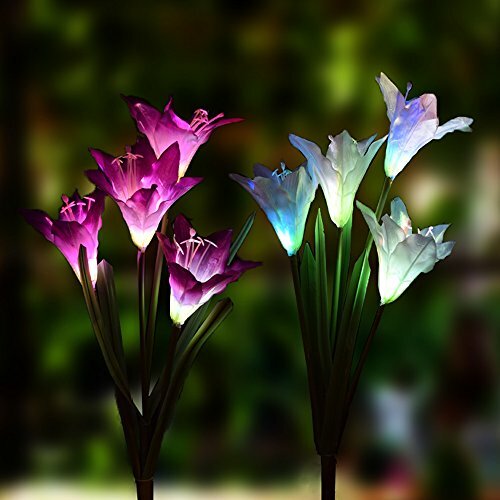 These flower-shaped lights also have a waterproof design that will protect them from inclement weather. A lifelike sculpture designed to be placed at a strategic location in your garden. Place it on a stone, a stump, or any raised surface and watch the yard come to life. 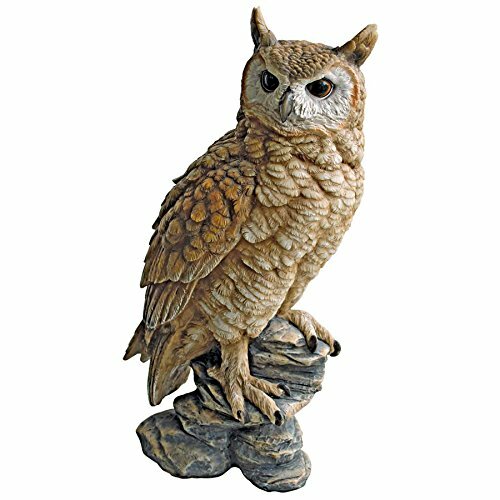 The best thing is that owl sculpture offers a second benefit: they’ve been known to keep pests out of the area, wary of the real birds of prey. 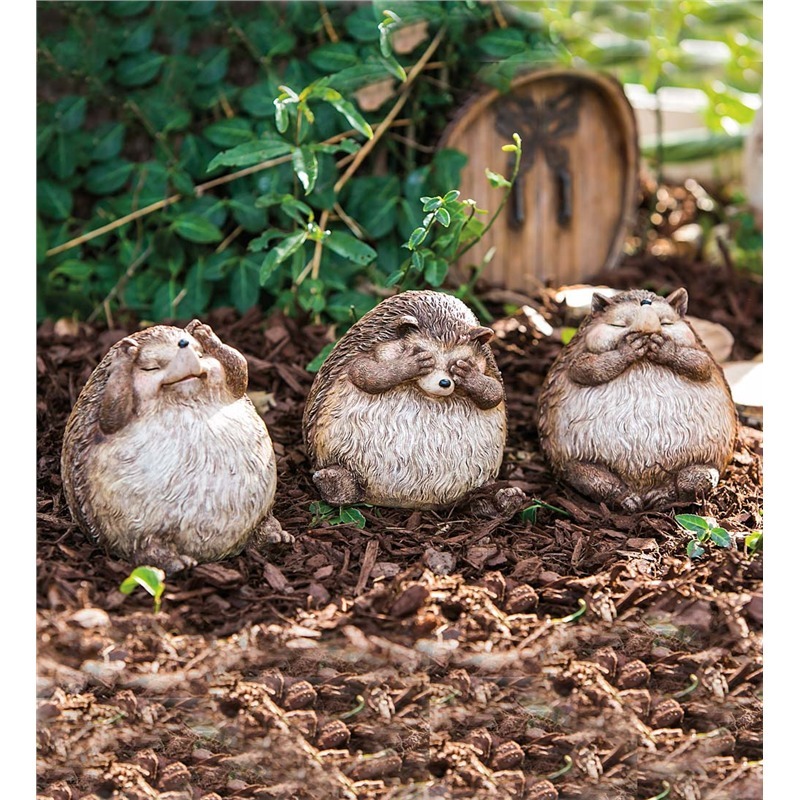 These hedgehogs are representing the iconic “no evil” stance, with a trio of little cartoonish animals making up the titular gestures. It’s ironic and fun, something that any garden could do with a proper dose of. If you’re into adding something a little cheeky to your landscape, this might be just the ticket. 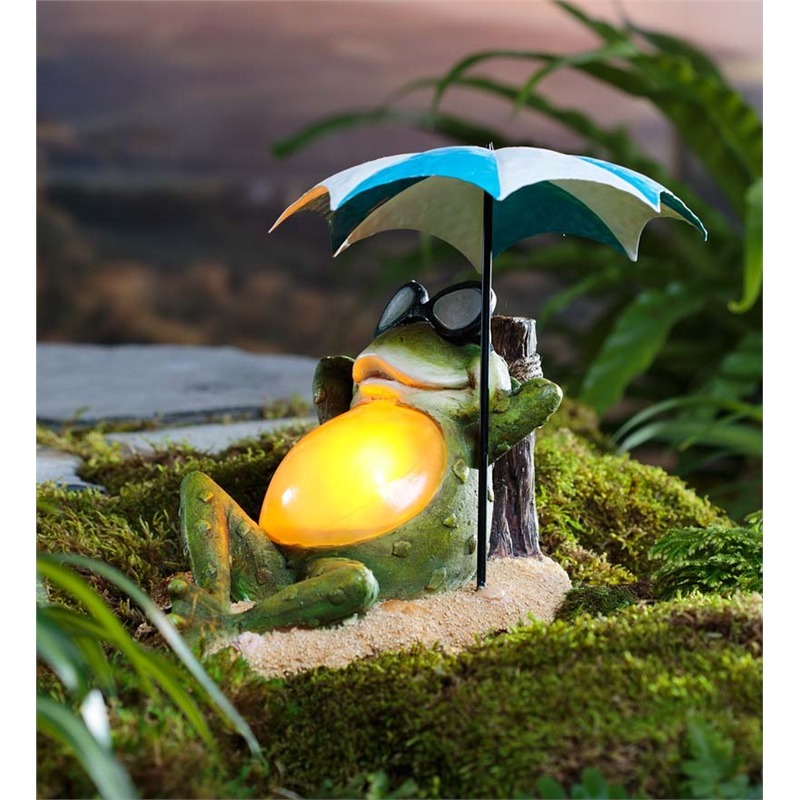 We’ve already shared an adorable little frog sculpture, also beneath an umbrella, but this guy is different. Not only is the sculpture a much more colorful affair; it’s enhanced by a built-in light mechanism, making the frog’s belly glow at night. It’s fun, fanciful, and not just a little bit cheeky. The 1960s style sunglasses really set the whole thing off. 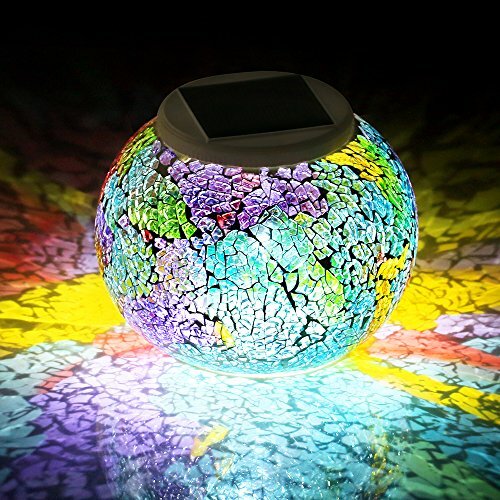 This solar-powered glass ball is designed with colored glass that has a mosaic design. When the sun goes down, this ball will light up for up to eight hours, and it can easily illuminate a table. This table lamp is perfect for a garden party, especially if you want to create a unique atmosphere for your guests. In addition, the light can be set to different color options, so you choose the color of your outdoor space. 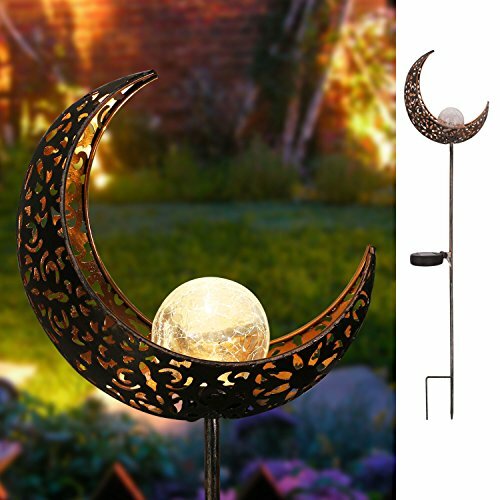 This staff-like garden ornament is designed with a bronze crescent-shaped moon that has an intricate pattern cut out of it. Inside the moon, there is a glass orb that is made out of crackling glass. This part of the garden decoration is solar–powered, which means that it will glow brightly in your garden with enough sunlight. In fact, the light will last for about six hours before the auto timer switches off. If you enjoy having unique pieces in your garden, then an Amish buggy that can hold a number of plants will be ideal. 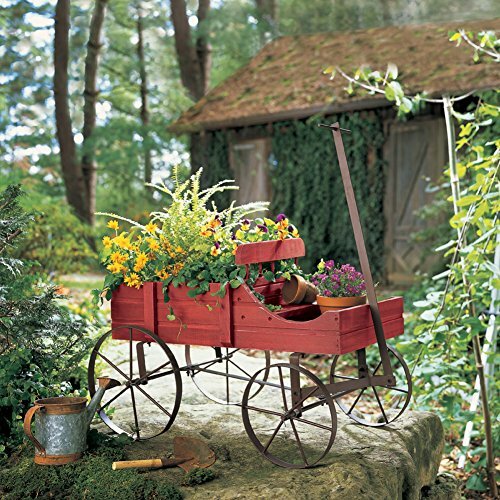 This wagon has a back area where larger plants will look great, and there is a front seat and floor area that will be perfect for smaller, already potted plants. This wagon is available in green, red, and blue, so you can choose a specific color to match your plants and other outdoor décor. This is a unique idea that many nature lovers will adore. 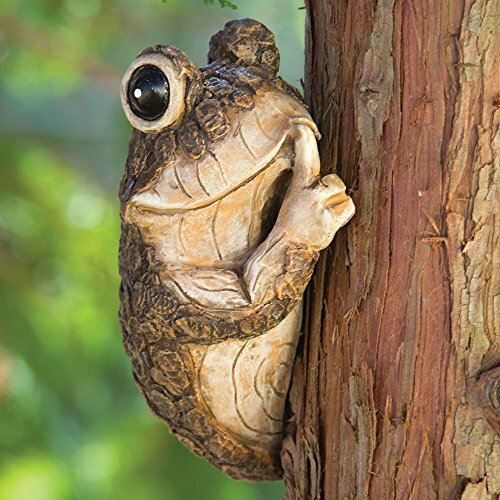 The frog is crafted from wood, but it is designed so that it can be positioned against the trunk of a tree so that it looks like it is peeking around it. In addition, the frog has its finger to its mouth to let you know to keep its location a secret. The back of the frog resembles bark, so it will blend in with its surroundings more easily. If you are trying to control the flow of the water in your garden when it rains, this rain chain will give you the drainage that you want without ruining the atmosphere in your garden with a traditional rain spout. 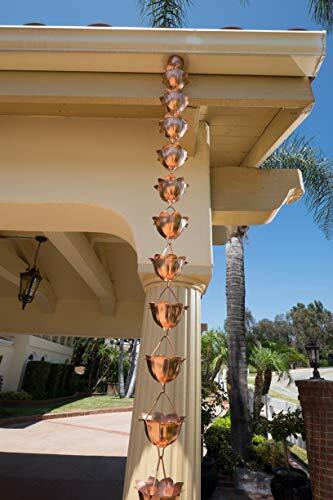 There are 20 cups on this 8 ½ foot chain, and when it rains they will fill from the top down until the water reaches a copper bowl at the bottom. 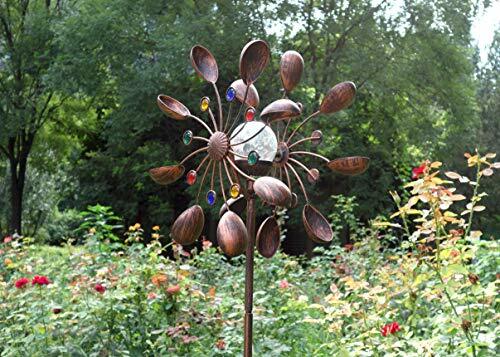 If you live in an area with a lot of wind, this wind spinner will look great in your garden. The main part of the spinner is bronze, and there are spoon-shaped arms on the head of the spinner that are designed to catch the wind. As it spins, you will see gems light up in four different colors. These gems are powered by the glass ball in the center, which absorbs solar energy. 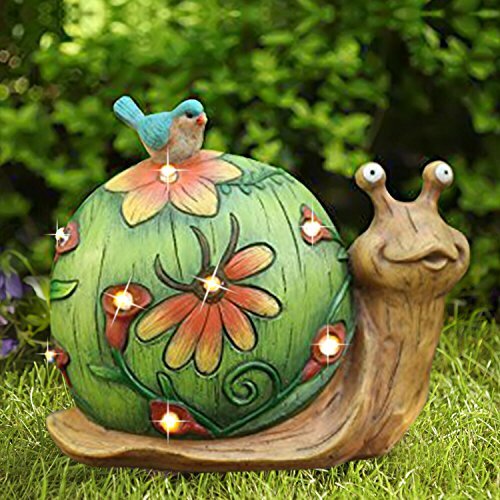 The next idea to decorate your garden is a cute light that can easily be used to light your garden path. The light fixture itself is crafted from beautiful stained glass that has the image of a dragonfly and flowers on it. In fact, this design was hand-painted on the glass, so no two will be exactly the same. The light is solar-powered, so with a full charge, you should be able to get light for up to eight hours. If you are trying to light up your outdoor space to make it more festive, this lighting decoration can easily be used, especially if you have a few large trees in the area. 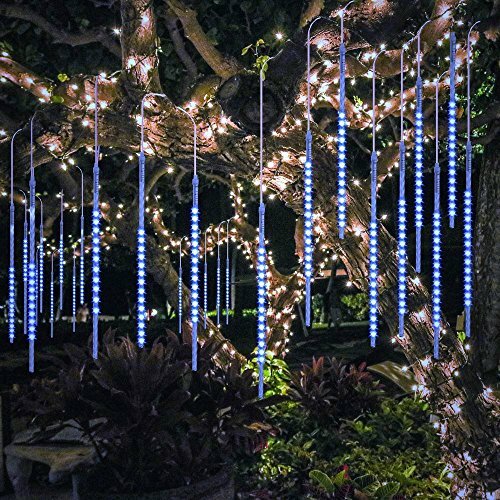 The lights are several different colors, and they will dangle from the tree in strands that resemble raindrops or snow falling from the sky, especially when you have the lights pulsing in a patterned sequence against the night sky. Another great way that you can light up your garden path and add some character to your outdoor space is to add some of these crackling glass balls. These are powered by solar energy, so you do not need to keep them plugged in, and they can stay lit for up to eight hours of time on a full charge. 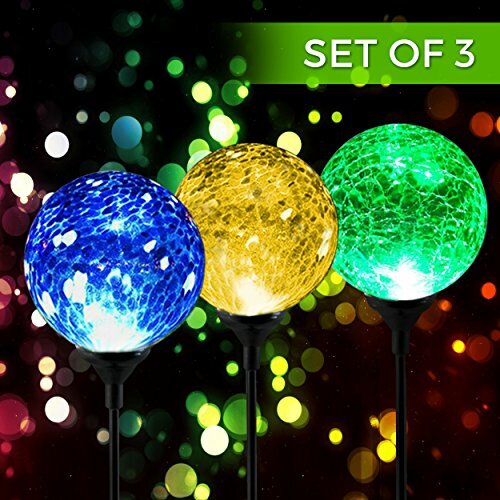 You can set the lights to a specific color or have them cycle through seven different color options. This decoration idea is a great one to consider if you have a few bare walls or fence line in your outdoor space. 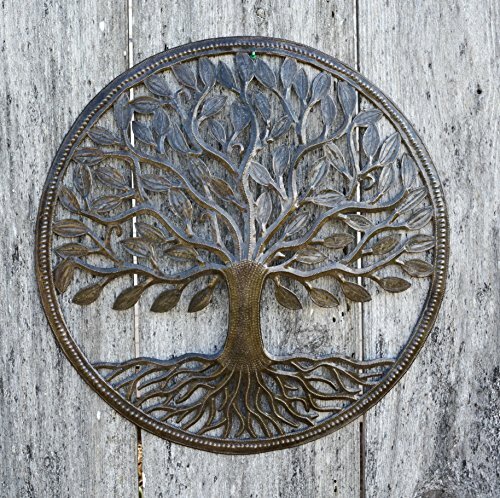 The circular piece of art is colored in dark rustic tones that will bring an earthy look to your garden. Inside the ring, there is a tree of life, which shows both the leaves of the tree and the roots. This unique decoration was crafted in Haiti, and each one is cut by hand from a 50-gallon steel drum. 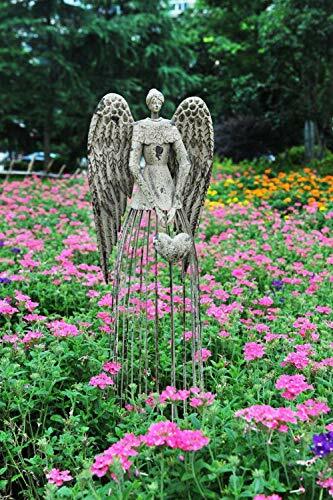 If you want an angel in your garden, then this one is a unique option that gives height to your outdoor space. It also has a lattice base, so you can easily train your plants to wrap around this part of the angel as they grow. This angel stands about 32 inches high, and she holds a heart in her hand as she keeps watch. 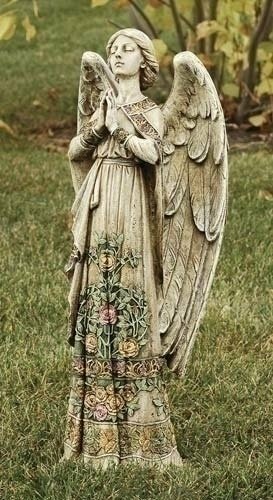 For another statue idea that you can place in your garden, this praying angel is a great option. It is a full 24 inches tall, and the angel has her wings out, which have a lot of detail. The angel is wearing a beautiful dress with roses on the front, and since she is so tall, she will look great in a rose garden. 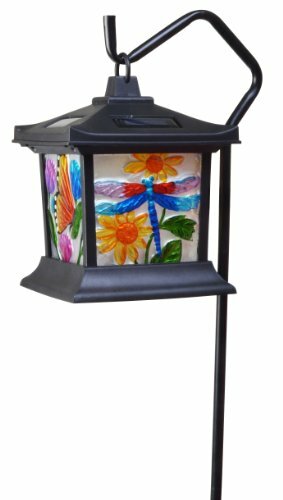 This is a colorful display that will look great on a patio, especially since the fairy decoration is one that is solar-powered so that it glows at night. The fairy is hand-painted, so there is a lot of intricate detail on the ornament. 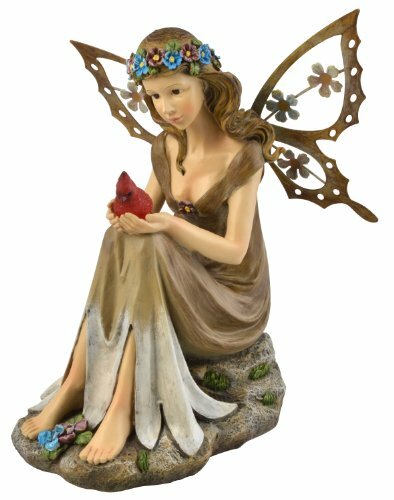 The fairy is holding a little red cardinal in her hands, which is the portion that glows when it has absorbed enough solar energy. 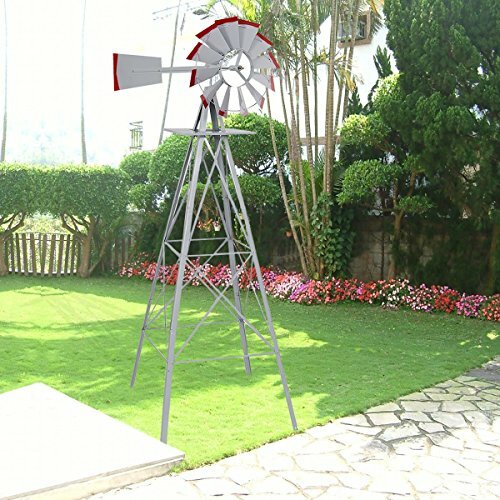 If you are looking for something to give your garden more height, then this windmill, which can also be used as a weather vane, is a great option. It is constructed out of iron, and the metal has been coated to help make it more durable, which means that it is rustproof as well as weatherproof. The tips of the propellers are painted red, which will add a bit of color to your space as well. 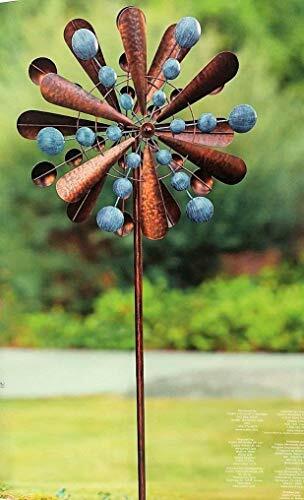 This is a beautiful bronze and teal wind spinner that will be mesmerizing in any garden, especially if it is in a windy location. The spinner is made from a durable steel material that is coated with a weather-resistant powder to help protect it from inclement weather. This decoration stands about 23 inches tall, so it will give your garden a bit of height, but not too much. 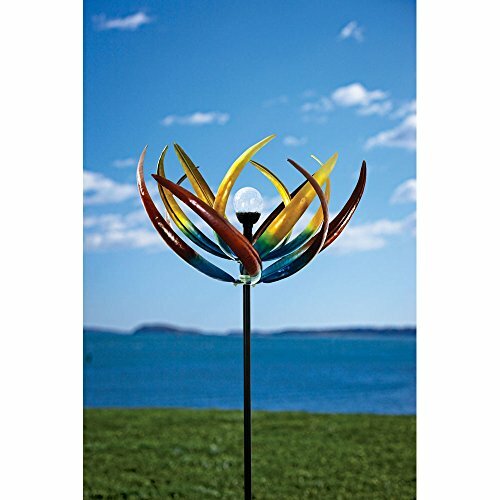 This wind spinner is designed to look like a tulip in the wind. The petals, which are red, blue, and yellow, will move in different directions because of the two-tiered design. In the center of the flower, there is a glass ball that will absorb sunlight during the day and illuminate at night. The color of this glass ball will change over the course of the night. If you have a pond or a water feature in your garden, then adding a heron to your outdoor space can add to the atmosphere that you are trying to create. 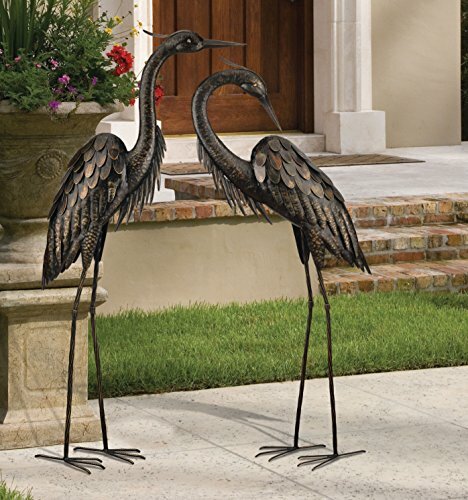 The bird stands a full 43 inches tall, which means that it will tower over many of your plants. The bird is a bronze material that looks great, and the heron is craning its neck so that it can preen the feathers on its back. This tree is an ancient tree with a face carved into its bark. There are two fairies on the tree; one is lying beneath the leaves while the other one is playing a violin on its roots. There is also a squirrel with an acorn at the base of the tree. This statue was painted by hand, so there are a lot of intricate details on the tree and the fairies. It has been coated with a waterproof coating to help protect it from the elements. This frog is designed to look like he is a guest in your garden who is enjoying the day. 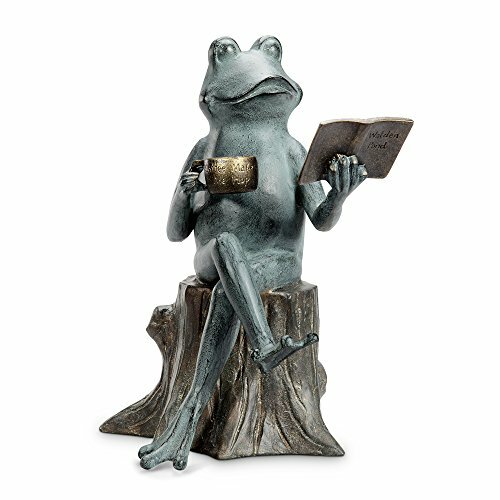 The frog can be seen here with a cute coffee mug that says “Coffee Make Me Hop,” and he is also enjoying a book entitled “Waldon Pond.” The frog is sitting with his legs crossed on a stump with a flat bottom that can easily be positioned on any flat surface in your garden. 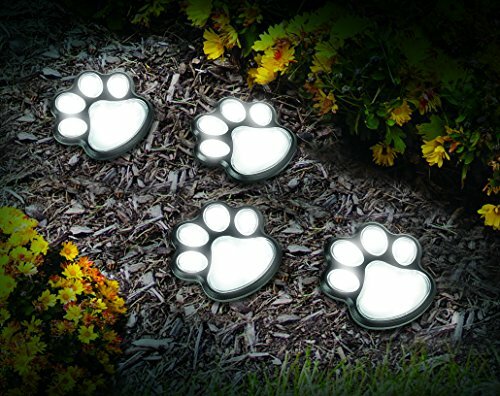 If you want to add some unique lighting effects to your garden, then these paw print lights are going to make your outdoor space much brighter. They look best in the soil because of the dark background, but if the grass is low, it can be used in a grassy area as well. These are solar-powered paw prints, so with enough power, you can keep these prints glowing all night. 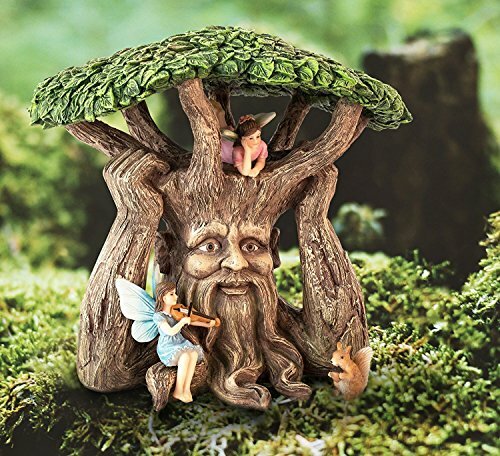 We hope you’ve enjoyed our selection of fantastical, fun garden accessories. While DIY projects can be fulfilling and more ornate structures can be incredibly useful, sometimes you just want to inject a bit of beauty and fun into the landscape without a lot of work. These pieces exemplify this idea.